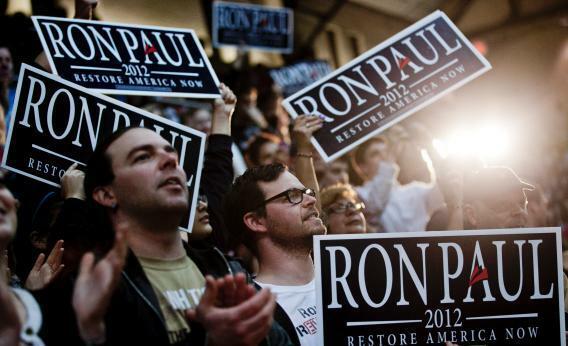 Will Ron Paul Backers Stand In The Way Of Romney's Vice Presidential Pick? Will Ron Paul Backers Stand In The Way Of Romney’s Vice Presidential Pick? COLLEGE PARK, MD - MARCH 28: Supporters of Republican Presidential hopeful Rep. Ron Paul (R-TX) cheer as he speaks during a town hall meeting at the University of Maryland on March 28, 2012 in College Park, Maryland. Paul is trailing his opponents in what has become a race for delegates until the Republican National Convention. Republican officials are still waking up to the fact that Paul loyalists – who control the majority of delegates in Maine, Minnesota and Iowa, and have sizable contingents in a number of other states – could very likely enter Paul’s name into nomination for vice president. This would force a roll call vote where each delegate of each state is polled on the floor of the convention. Such a move would transform a symbolic procedure that has taken mere minutes in the past several conventions into a chaotic and time-consuming spectacle that could eat up the better portion of a day. Not only would such a floor fight step all over the message of party unity and strength that the Romney campaign hopes to drive through the convention, it would also open the door for alternatives to Romney’s choice to gain momentum and further drive the process off the rails. For example, if Romney chose Sen. Rob Portman (R-Ohio) as his vice presidential pick, but the Paul forces leveraged their impressive foothold in several states to nominate Paul from the floor, then someone like Sen. Marco Rubio (R-Fla) could emerge as the preferred pick for many delegates as the convention goes into a roll call vote. And Rubio’s name could be entered into nomination, in addition to Paul’s, if a plurality of five states voted to nominate him. Where things would go from there is anybody’s guess. It is the word “plurality” that is key. On January 17, 2008, eight months before the GOP convention in Minneapolis-St. Paul, the RNC’s rules committee changed the process for nominating the presidential nominee or vice presidential nominee, so that instead of requiring a majority of delegates from five states, a candidate needed only a plurality of delegates from five states. As Ward notes, the party could change the rules before their convention this August, but grassroots activists loyal to Paul would surely cry foul. Figuring out a way to appease the Paul wing of the party without letting them dominate the convention – and distract from the assault on Barack Obama’s economic record – is shaping up to be a real challenge for Team Romney.